Right away I clicked with the supervisor. Warm, welcoming and so easy to talk to, I found myself feeling comfortable and able to open up to her from the moment we began talking. A great supervisor makes the difference when you’re looking for a centre, and here at Kids’ Campus Whitby I found a lot of signs that this was a caring and professional centre. My guess is that the supervisor is experienced and has worked here for some time based on the few processes I noticed within this centre. Small but important touches like a colour-coded cleaning cloth system was one of the first of these that I noticed, and this system is visible to anyone within the classroom. The reason for this system is to maintain their high standard for health and safety. A cloth used to wipe a kitchen surface is never used to wipe a bathroom surface, and this colour coding system helps reinforce this. As a parent, I appreciate their efforts. It demonstrates transparency, effective management and safety. Another touch I really liked was that the daily schedule for the children is adjusted for each season. The staff take into account the weather temperatures and the best times of day for sunshine to make sure the children get the best out of their time outdoors. 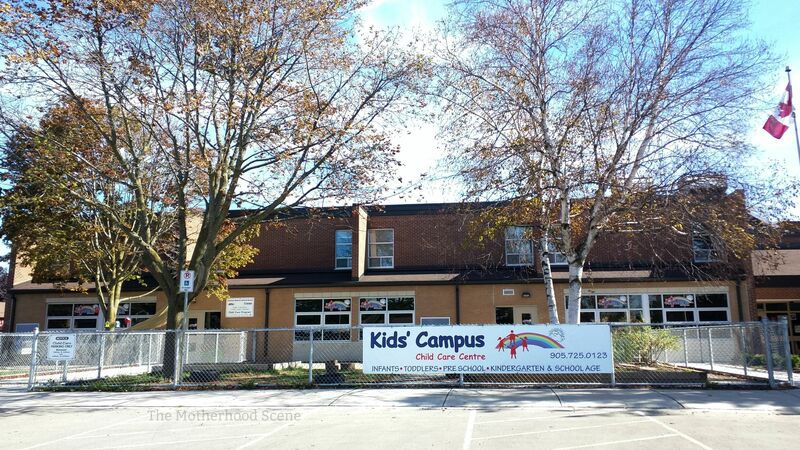 Another reason for this adaptive approach is because Kids Campus Whitby is situated within West Lynde Public School. These adaptive schedules take into account busy periods in the day for the elementary students (like pick up after school) and times when the elementary students are on break, like in the summer. The infant rate is $243 full time or $199 part time, weekly. The toddler rate is $223 full time or $179 part time, weekly. Parents are required to provide $100 upfront upon registration. $25 is a non-refundable administration fee and the remaining $75 is a deposit fee. Centre is open from 6.15am to 6.30pm. Located close to the 401 and Whitby GO Station. All laundry is handled on site. Follows an emergent curriculum approach to learning. Why? I think they are pretty harsh comments without a reason. What are some of the reasons you love this centre?